I hope this finds you well and not too stressed by the holidays. This time of year always sneaks up on us (me at least) and it seems we can never get everything done. My goal was to get my Christmas cards done before my trip.....Maybe I will just send card kits this year :) I do afterall have most of the pieces cut. However I am leaving Saturday for Norway, so Christmas cards are on hold! There has been the usual year-end madness here as I am sure there is at your home. Here it entails ordering for Valentines Day, receiving and filing in of Christmas, getting our trip to Phoenix scheduled for Creativation (formerly CHA, HIA and I can't remember all of the other names for the past 30 years) so we can check out everything new and filling in some gaps in our inventory. That means if there is a particular item, style, category, that is of interest to you, please let me know and we will be on the look-out. Why wait to craft? With the Gemini Jr, you can zip through cutting and embossing projects with the push of a button. This compact powerhouse uses a high-pressure system that delivers fantastic results even with intricate designs, while a pause, reverse and resume feature gives you even greater control and improved efficiency. It even comes with a beautiful assortment of dies, and an embossing folder to get started. Let Jr. put your creativity on the fast track. Included in the box: Gemini Jr. machine, 6 metal cutting dies, 3D embossing folder, 2 clear cutting plates, metal cutting plate, magnetic shim, plastic shim, rubber embossing mat, user guide & power cord. Since Christmas is on a Monday, we thought instead of having class on the prior Saturday we would have a little get-together. We will be serving soup, bread, and punch. We will have a cookie swap, so if you would like to attend, please bring 4 dozen of your yummiest cookies. Everyone will get a chance to trade cookies and go home with a nice assortment. Just bring yours on a tray or in a box or container of some sort. You don't need a fancy presentation....you will get to go home with lots of different cookies to serve for Christmas as you will get a few from each participant. This will be a fun way to spend a couple of hours with friends. Please let me know if you plan to addend so I can make sure I have enough soup for everyone! I hope you have a safe and happy holiday season. Don't forget to put a Cat's Meow gift certificate on your list for Santa! Merry Christmas and Happy Hannukah to all! We added a new vendor this month, Alexandra Renke. 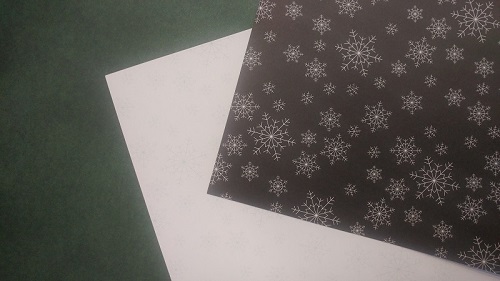 We have several lovely 12x12 papers from this new German company. We have received three so far and have a couple more on back order. These are a really nice quality paper, printed one side only. It is a bit hard to see in the photo, but the green one is a subtle all-over fir tree design. We also have some beautiful new paper from Echo Park. 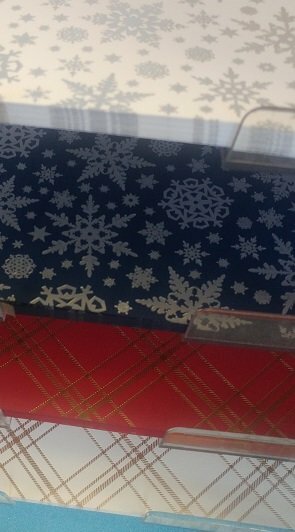 This is a foiled paper and is really spectacular. 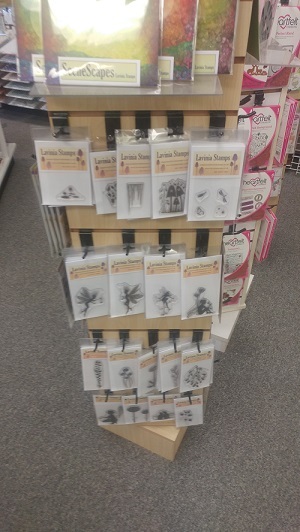 A selection of all new stamps and printed backgrounds arrived from Lavinia....they are fabulous, check them out! 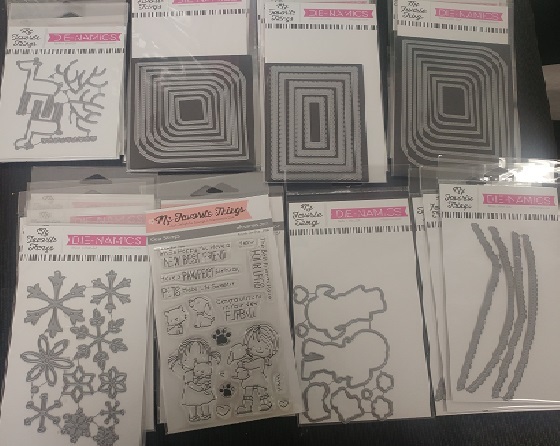 We also have a great selection of new images with matching dies from Elizabeth Craft Design that are perfect for slider cards. Since the Wood Effects papers from Moda Scraps were such a hit in 6x6, we ordered them in 12x12. There are 12 different wood (plank) prints in the pack, each sheet a different print. Yesterday we received a shipment from My Favorite Things...it included the 'in demand' adorable reindeer and the newest nesting dies. The stamps are an adorable set that features pet images and words and is unique in that you can use words that relate to pet adoption! Be sure to check out the class schedule for December and let us know if you plan on attending the Christmas lunch/cookie swap! We would love to see you. 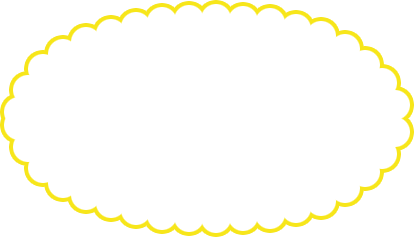 Click here for classes!